Three-year-old Liam was the youngest of four children and is survived by his brothers, Bennet (9) and Micah (7) Harris; his sister, Theresa Grace Harris (5); his great grandmothers, Aileen Harris of Denton, TX, and Alice Brase of Virginia Beach, VA; his grandparents, Bonnie and Marshall Harris of Seguin, TX, and David and Suzanne Pointer of Duncanville, TX; his aunts, Amy Schoening and Colleen Parks; uncles, Todd Schoening and Stephen Parks; and cousins, Annalise Schoening, Amelia Parks, and Berkley Parks. Liam loved life and had a beautiful smile. He was a model patient at both Children’s Health Children’s Medical Center in Dallas and Cook Children’s Medical Center in Fort Worth. Liam underwent 13 rounds of chemotherapy, 7 surgeries, 1 stem cell transplant, 26 radiation treatments, 2 clinical trials, and countless scans. He loved Curious George, but was rarely seen without his Minion hat. He called himself “Lima: The Boy with the Yellow Hat.” His hugs almost always included a pat on the back. Liam’s favorite things included baseball, the song “Take Me Out to the Ballgame,” flashlights, coins, bubbles, the number 8, the colors brown, orange, and green, and Krispy Kreme donuts. Thanks to HopeKids, Liam had a wonderful trip to see the RoughRiders play in Frisco, and he was able to run the bases after the game. Liam also attended a Texas Rangers game with Make-A-Wish. Before he lost the ability to walk, he loved to run and dance on the circles he found in the sidewalk. Liam continued to do his signature thumbs up high five and a hand bump called “Sweet Potato/French Fries” until two days before his death. Liam’s Celebration of Life Service will be held on Saturday, September 26, 2015, at 6 pm at Hillcrest Baptist Church, 265 W Pleasant Run Rd, Cedar Hill, TX 75104. The dress is casual and fun – bright colors, baseball jerseys, Curious George and Minion attire encouraged! Attendees should feel free to wear crazy socks, bring a flashlight, balloons, or coins, if they feel so moved. 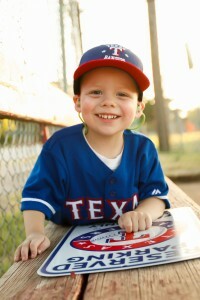 In lieu of flowers, please, feel encouraged to make a donation to HopeKids North Texas in Liam’s honor (https://www.firstgiving.com/team/306425).